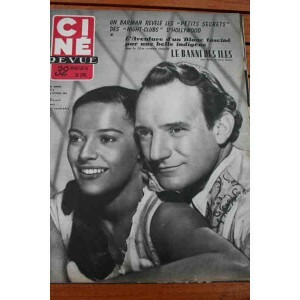 A few days ago I promised you a picture special on Algerian film star Kerima, and here it is. 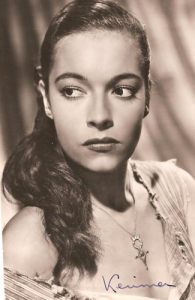 True, she's not a dancer but it's so rare to find evidence of north African stars in Hollywood during the 1950s that I thought I'd make an exception. 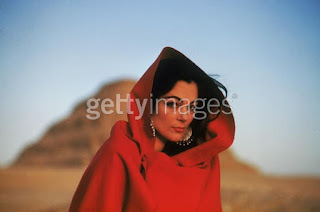 And, after all, she did play "The Belly Dancer" in a 1972 episode of short-lived UK TV spy series The Adventurer (one of her last roles). 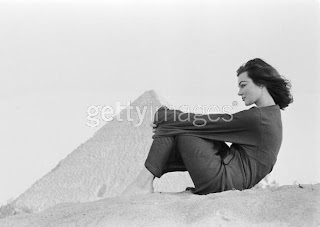 Her career, based mainly in Italy, really seems to have petered out in the late 1950s. Even her IMDB entry is practically empty. Apart from the fact she was born in Algiers on 10 February 1925 I have no biographical information about her. 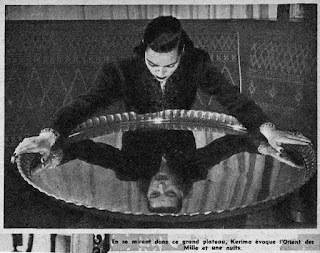 En fait, if you speak French there's an article about her here, with some lovely pics of her visiting a mosque in Paris during a publicity junket for Outcast of the Islands. From this I gleaned that she was studying medicine when fame came calling, that her father was French and her mother an Arab, and that she married Guy Hamilton, whom she met on the set of Outcast. (Hamilton went on to become a notable director in his own right, mainly of James Bond films including Goldfinger and Diamonds are Forever). Or, as the original puts it rather more poetically, "[Hamilton] too was smitten by Kerima's charm and beauty, and it was not long before they were man and wife." Aw! The writer then goes off on one about Kerima visiting a mosque without covering her hair and how she'd never get away with that today and blahblahblah. "Gazing at herself in this large platter, Kerima evokes the Orient of the 1001 Nights." More glamour after the jump. Yes, that really is the original caption to that picture. "A crop of exotics." If you do decide to call your dance troupe that, please don't tell me because I will beat you with a limp celery stick. These next two were taken on location during the filming of Land of the Pharaohs. 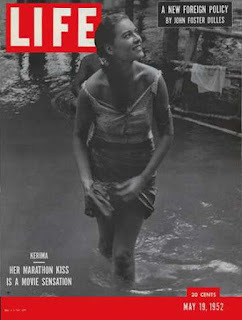 These are covers from magazines LIFE, Picturegoer and French Cine Revue to mark the release of Outcast of the Islands. (At time of writing you could buy copies of this 19 May 1952 issue of LIFE on ebay.) 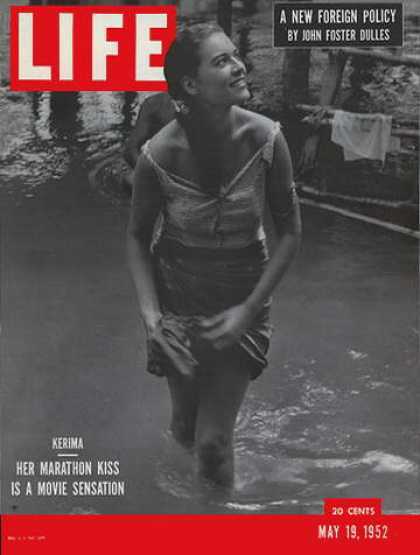 The strapline reads "Kerima -- Her marathon kiss is a movie sensation". How can something sarong feel so right? "I love you, Laura. I shall love you always until the end of my life. I can't look at you now 'cause I know something. I know that this is the beginning of the end. Not the end of my loving you but the end of our being together. But not quite yet, darling. Please. Not quite yet..."
there was "The Sarong Song"
*sniff* Excuse me, I have something in my eye... where was I? 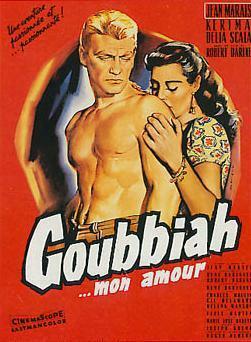 Oh yes, Trevor Howard and the kissing marathon. For audiences used to seeing Howard as a repressed Englishman with a steady-burning flame in his heart, it must have been quite a shock to watch him running around Ceylon with a gun and a raging, er, lust for a "local" girl. Especially a local girl who spends the entire film absolutely sopping wet. Steady on etc. OK, no more sarong puns. Promise.